Using an idea from The Big Book of Catholic Customs and Traditions for Children's Faith Formation, we made a palm branch using all the palms in our family and hung it on the sliding door in the kitchen. As you can see in the picture, it is an absolutely gorgeous day today so we are headed outside to BBQ and enjoy the sun, before the rain returns in a couple days. I hope you all are having a very blessed Palm Sunday! O Almighty and everlasting God, Who didst cause our Savior to take upon Him our flesh and to undergo the cross, for an example of humility to be imitated by mankind: mercifully grant that we may deserve to possess not only the lesson of His patience, but also the fellowship of His Resurrection. Beautiful, we did this too :) Hugs! Oh, fantastic! I love the big daddy hands on down to the littlest ones hands. I have that book too, darn it. I'll have to mark it to do next year. Thank you for sharing. God bless! we are having great weather up here. i hope it stays nice there for the weekend. 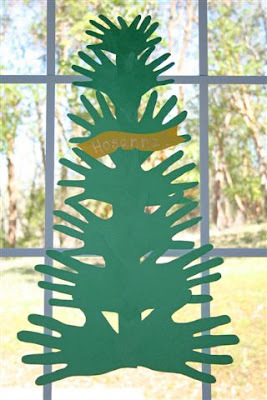 What a wonderful craft for Palm Sunday! I will have to print this and put it in my notebook for next year. You do an amazing job with your family. I am just discovering you and love all your stuff. I wanted to let you know, too, that I linked to the Catholic Cuisine site from mine. It's a great fit with my mission. I couldn't get the widget to work with Wordpress, unfortunately. Thank you for all the good "keeping it holy" ideas for kids! If only I could find time to DO some of them! This is too cute! I'll have to try to remember it for next year!! Thanks - we had fun making ours! Thank you for linking at the Lent Link up at Monica's blog!! I like your idea, I might try it this Holy Week! Blessings! !